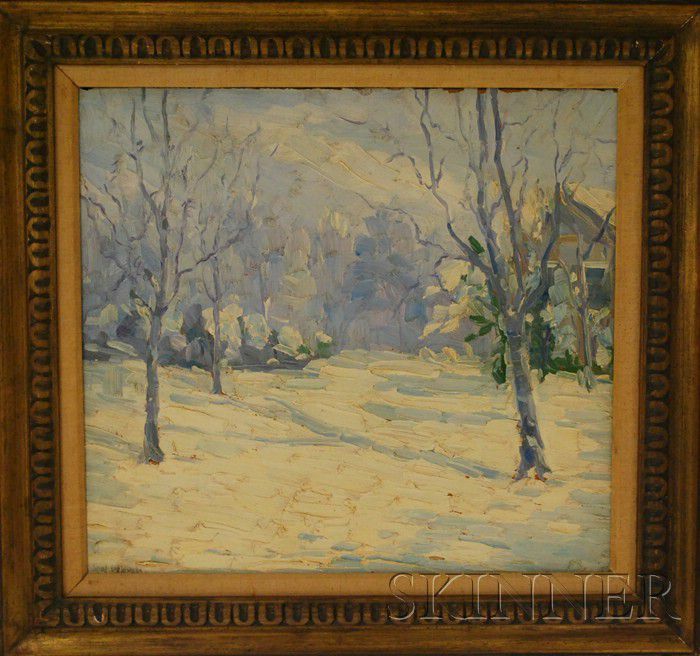 Jozef Orlowsky (American, 20th Century) Winter Scene. 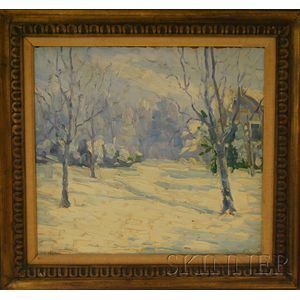 Winter Scene. Signed "Josef Orlowsky" l.l., inscribed "Jozef Orlowsky/Provincetown/Cape Cod" on the reverse of the frame. Oil on board, 20 x 22 in., framed. Condition: Paint losses, surface grime. Arthur W. Moore (British/American, 1840-1913) Wooded Grove in Autumn. Ronald Von Ehmsen (American, d. 1963) Jazz. Horace P. Giles (American, 1850-c. 1930s) Portrait of a Young Woman. Northern School, 19th Century The Village Waterway.